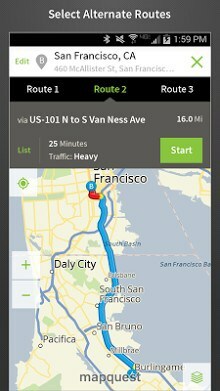 MapQuest is your go-to app for live maps, GPS, voice navigation, and live traffic updates. Whether you’re running a quick errand across town or taking a road trip across the country, MapQuest has the trusted directions and traffic info you need for stress-free navigation. 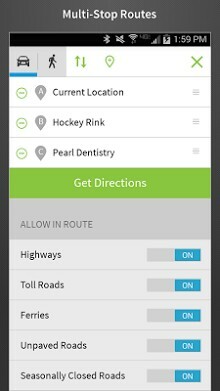 Our app can route you around accidents, help with multi-stop directions and even has alternate routing capabilities, robust bookmarking options, and handy sharing features. MapQuest is here to help get you where you need to go, wherever life takes you. • Get voice-guided turn-by-turn navigation for walking or driving directions. • Have peace of mind knowing we’re using the latest traffic data. Live traffic updates and automatic re-routing will help you get there on time. • Choose from up to three different driving routes (when available) to get you to your destination most efficiently. We’ll take traffic, road closures, and more into account so you can choose the most optimal route. • Impress your boss, family, and friends with an on-time arrival with our ETA (estimated time of arrival) and location sharing features. • Bookmark your home and work addresses so you can find your way to either at the push of a button. • Quickly search for nearby points of interest in your favorite categories like coffee, restaurants, gas, and more with our industry-first layers bar! • Advanced search uses your contacts, recent searches, top categories, and nearby points of interest to help you find your destination faster. • Save a few bucks when you click on nearby gas stations and view and compare their current gas prices. • Find a place to rest your head. Explore the area and book a nearby hotel directly from the app! • Show your team spirit with MLB.com Team Kits, available for purchase in-app, custom logos, start screen, accent colors and saved routes to the game ensure your navigation app is as die-hard as you are! Join the millions of people that have already downloaded the free MapQuest app as their own personal navigator.